Recently, I've seen ads for continuing education programs that nearly promise that their program will share inside knowledge on how to get the Centers for Medicare & Medicaid (CMS)(www.cms.gov) Primary Care Incentive Program (PCIP)(www.cms.gov) bonus. If you’re interested in the PCIP, I think I can save you from spending money on a continuing education program and some time. If you're a primary care physician who provides mostly office, nursing home and home visits to the Medicare patients in your practice you qualify for the bonus. Well ... it's almost that simple. First, you must have enrolled in Medicare with a specialty designation that says you are a family physician or other primary care specialist. 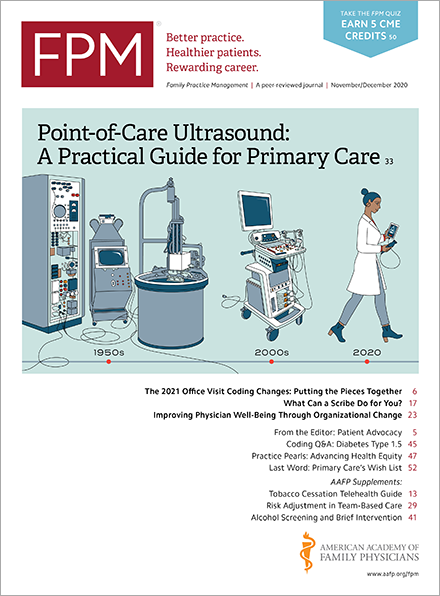 Under the Affordable Care Act, only physicians with a primary specialty designation of family medicine (08), internal medicine (11), geriatric medicine (38), or pediatric medicine (37) are considered potential primary care physicians. If a claim for a primary care service is submitted by a group practice, the claim must contain the National Provider Identifier (NPI) of a qualifying physician or provider on the claim line for the primary care service in order to qualify for the incentive payment. Nurse practitioners (50), clinical nurse specialists (89) and physician assistants (97) may also be eligible for the PCIP regardless of the specialty area in which they may be practicing. These specific nonphysician practitioners are eligible for the PCIP based on their profession as long as their historical percentage of allowed charges for primary care services equals or exceeds the required threshold. Nonphysician practitioner services provided incident to a physician's service would be credited to the billing physician's allowed charges and payments. Only those services billed under the nonphysician practitioner's NPI will count toward their PCIP eligibility and bonus. Second, a minimum of 59.5 percent of your allowed charges under the Medicare Physician Fee Schedule (PFS) in 2009 (the denominator, as shown below) must have been for designated primary care services (the numerator, as shown below) to qualify for the 2011 bonus. Primary care services are those reported with E/M codes 99201-99215 and 99304-99350. Charges for hospital and emergency department visits are removed from the denominator as well as services paid outside the PFS, including all lab charges and drugs, including vaccines, paid under Part B. Other ancillary services provided by physicians and paid under the physician fee schedule will be included in the calculation of allowed charges. If you wish to make your own determination on your claims history for 2009 (on which the 2011 incentive will be based), you need to run two billing reports by individual NPI number. HCPCS codes for medications commonly administered in the practice and for durable medical equipment (DME) such as crutches, canes and glucose monitors. The second report would be of the amount of total Medicare allowed charges in 2009 for claims billed with codes 99201-99215, 99304-99350. You then divide the total allowed charges of the second report by the total allowed charges of the first report and multiply by 100. The result must be 59.5 or more to meet the criteria. The PCIP payments will be calculated by the Medicare contractors and made quarterly for the primary care services furnished in that quarter. The incentive payment is based on the amount paid, and not the Medicare approved amount. Contractors will pay the primary care incentive payment at the same time and on the same check as the HPSA physician bonus when both are applicable.